Nadine Hattom is an Iraqi artist currently based in Berlin. Her recent series, Shadows explores the Iraqi landscape with images from the U.S. State Department of Operation Iraqi Freedom. It was on display at the Marrakech Biennale 2016. She speaks to Ruya about this, and her earlier work, combining sculpture and photography. What influenced the recent series Shadows? Three years ago, I was working on another project in Jordan. I wanted to cross the border into Iraq, but this was impossible, since the Anbar province is a lawless place that is governed largely by bandits, and the risk of being kidnapped is high. 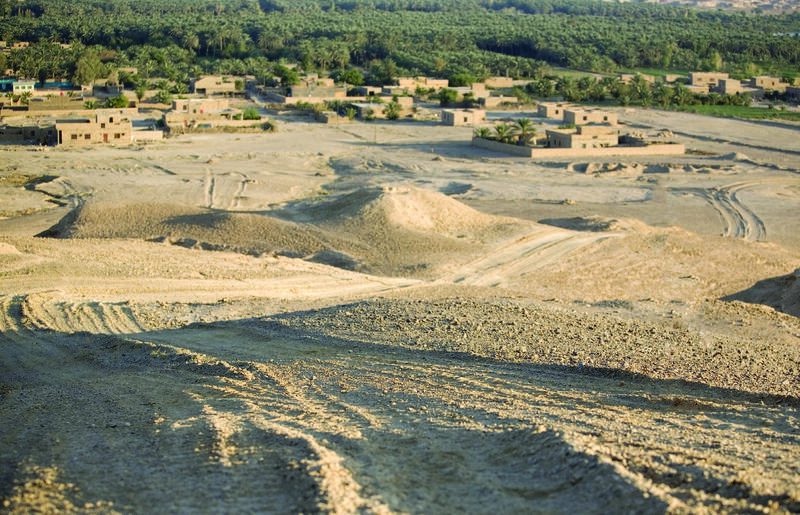 I started looking at images online, mostly of the landscape in the Anbar province at the border of Jordan and Iraq. I couldn’t find any without American soldiers in them. I wanted to see Iraq without thinking of it as a country at war. You have used images from the U.S. State Department website, taken during Operation Iraqi Freedom. Why use those images in particular? By using public domain images, the question of ownership presented itself. Iraq’s land is under much contention currently. I am questioning whether the land itself has become public domain. In addition, these were high resolution, good quality images that I could edit. U.S. Marines from 1st Platoon, Alpha Company, 1st Battalion, 7th Marine Regiment patrol from Expeditionary Patrol Base Dulab to a ridge along the outskirts of Dulab, Iraq, Sept. 26, 2007. The Marines are working with Iraqi police in support of Operation Iraqi Freedom in the Al Anbar province of Iraq. (U.S. Marine Corps photo by Cpl. Shane S. Keller) Nadine Hattom, from the series Shadows (2015). Courtesy of the artist. How did you produce the series? I chose images that could be turned into beautiful landscape images: empty landscapes and historical sites, to take it back to a time when all this war technology and sprawling cities weren’t there. I wanted to reclaim this land and show it in a different light. Using photoshop, I removed the soldiers that were in the images, and left only their shadows, an impression of what was there. Though I edit pixel by pixel, I didn’t do this perfectly as I wanted to show that the images were disturbed, to create a tension. I also displayed the images with the original caption that I found on the U.S. State Department website. I have printed them on a matt fibre paper, so it looks like the stone will crumble in your hands. A U.S. Marine with a ground combat element assigned to Delta Company, 2nd Light Armored Reconnaissance Battalion, Task Force Mechanized, Multi-National Force – West walks through the Hatra Ruins in the Jazeerah Desert in Iraq on July 20, 2008. The task force is conducting disruption operations in the area to deny the enemy sanctuary and prevent foreign fighters from accessing the area. DoD photo by Lance Cpl. Albert F. Hunt, U.S. Marine Corps. (Released). Nadine Hattom, from the series Shadows (2015). Courtesy of the artist. What was the first image that you worked on? 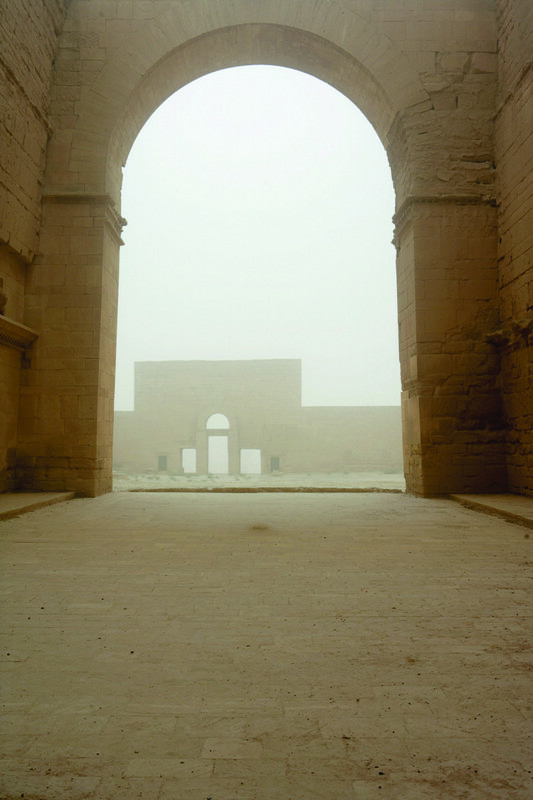 It was a photo of the Hatra ruins, which has a soldier standing up in the middle, looking up at the arc. This image appears on the wikipedia page for the Hatra ruins. 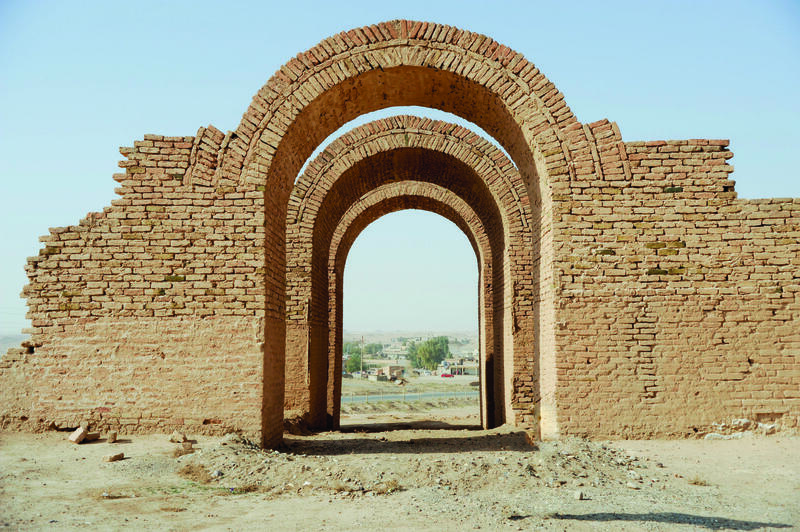 Today, these ruins have been destroyed by ISIS. Did your ideas change when ISIS took control of parts of the country in 2014? Yes, the narrative became more complicated and it was no longer just about the U.S. presence in Iraq. I took a break to think about what I was trying to say. I now let the work speak for itself, as there are many angles to this story. 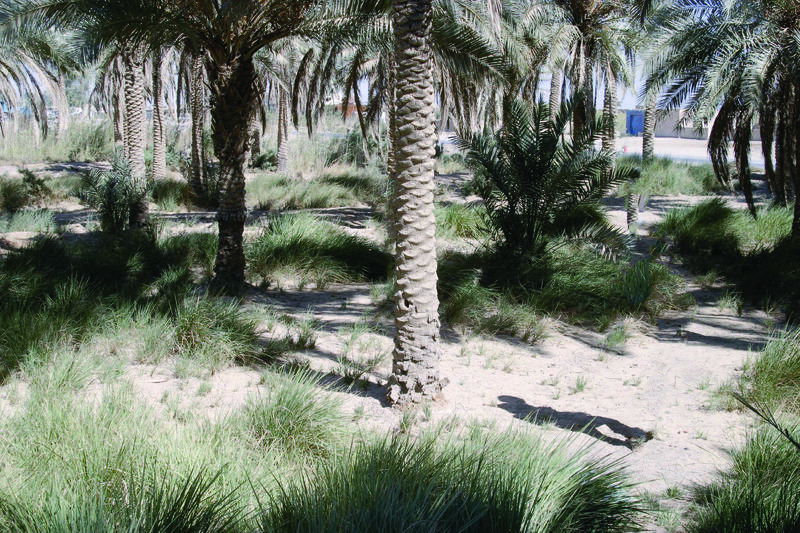 U.S. Marines of Company G, 2nd Battalion, 2nd Marines, fall into a tactical column as they maneouver through a palm grove to conduct a security patrol in Fallujah, Iraq, on Oct. 22, 2005. DoD photo by Sgt. Paul S. Mancuso, U.S. Marine Corps. (Released) Nadine Hattom, from the series Shadows (2015). Courtesy of the artist. What would you want to say to the soldiers in the pictures? That is a difficult question as I have so many mixed emotions, a bit of anger, but also I don’t feel any blame. My brother lives in the US and a couple of years back we met a homeless war veteran who had fought in Iraq. My brother told him he appreciated what the Americans had tried to do in Iraq. He replied “We made things worse”. I realised then that it was a multifaceted story. As an artist working with photography, what are the differences between working on someone else’s image, instead of taking your own? I see myself as an artist who uses photography as a medium. When you use an image that has been taken by someone else, it is an insight into another person’s imagination, the way they see the world. Therefore, it can be an act of empathy to appropriate the image, by saying ‘Well, let me look at the world through someone else’s eyes’. What became really apparent in the Shadows piece, is that when you remove the subject of the image, you are looking at everything that the photographer deemed secondary. My proposition was these surroundings were in fact the real subject of the image. How have images from the creative commons, that is, works available for others to build upon legally and to share, changed the role of the photographer? I find this really exciting, despite the fact the world is saturated in images. We are starting to look at images as a vocabulary. An image can be read like a word, and the elements in it are like the alphabet. Creative commons, makes that vocabulary available, and it is speaking the language of our times. Your earlier project Mayssa and Fetheya began in Jordan’s camp Zaatari, and is about two women refugees from Syria. How did you tell their story? I took photographs of the possessions they had when they left their homes in Syria. These objects became portraits of the two women. 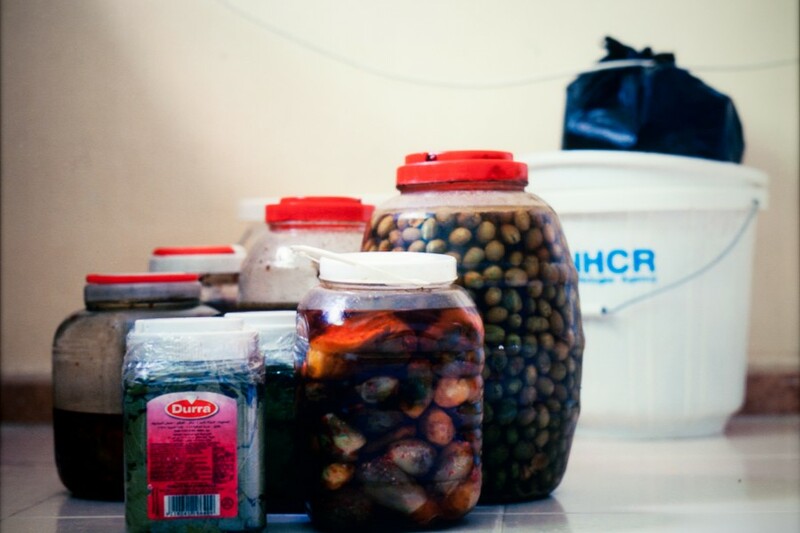 Fetheya’s portrait was jars of homemade olives, pickles and vine leaves. Mayssa’s portrait included everyday objects that actually related to her job as a hair stylist, she was thinking about the tools she needed to provide for her family. For the exhibition in Berlin, I displayed photographs but also reproduced some of these objects. 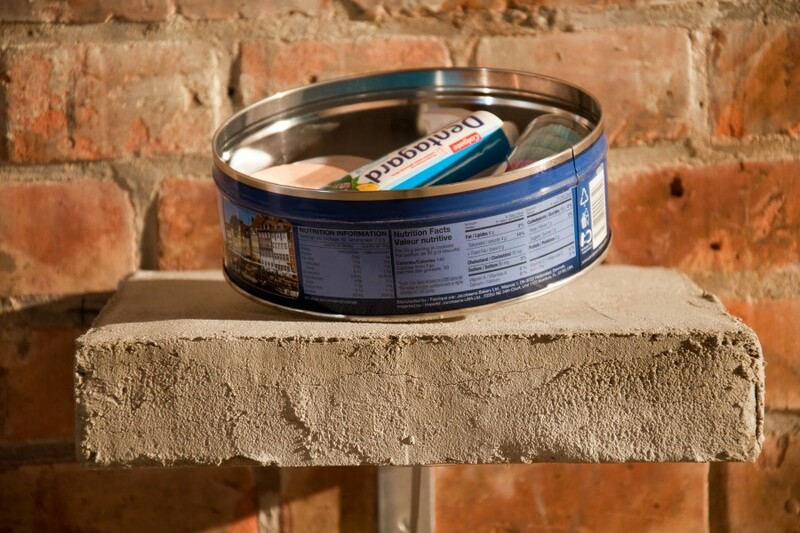 I bought a hairdryer and toothpaste from local shops, and reproduced some of the food containers using plaster. Nadine Hattom, from the series Mayssa and Fetheya, 2013. Courtesy of the artist. Your family, as well as the Mandean community of Iraq, live mostly in exile. How does your understanding of families and communities in exile shape a piece about refugees like Mayssa and Fetheya? This piece focused on the simple things that we take with us, and that connect us to other people. On the one hand, objects like Mayssa’s hairdryer reflect her aspirations for the future, on the other, Fetheya’s pickled olives were a way of preserving her culture. In my family and the Mandaean community, food plays a crucial role. It is such a sensory and joyous way of connecting to your heritage and to share that heritage with the people around you. Nadine Hattom, from the series Mayssa and Fetheya, exhibition view at Großer Wasserspeicher Prenzlauer Berg, Berlin 2013. Courtesy of the artist. Artists provide a visual language with which to engage in the humanitarian conversation. It can be very powerful. My role as an artist is not to inform the public or facilitate solutions as journalists and humanitarians do, but to find and communicate the essence of my experience and the experience of those who have also been displaced. I will be exhibiting new work, Sirocco/Shlūq/شلوق exploring the role of storytelling and the evolution of language for Languitecture, a group exhibition at P21 gallery in London in September 2016.